Which part of China are you from? I’m from Shandong. From Beijing, it’s 1 and half hours by plane and at distance of 3 to 4 hours by bullet train. My hometown is the most eastern part of the center of the province. The sea is close by as well. If you say what is the specialty of the province then it is the “Shandong large steamed bun.” This bun is different to steamed meat buns as it contains no meat and is made only of wheat just like bread. It is one of our staple foods. Our province is also famous for a large type of leek (Zhangqiu green onion)! And beer produced in Qingdao. This beer is sold at retailers all over Japan as well as at the Sake Festival in Saijo. Are there many Japanese people in your home town? Yes. There are many foreigners living in my hometown, especially in Qingdao-City, where my home university is located, just as in Higashi-Hiroshima where Hiroshima University is located. 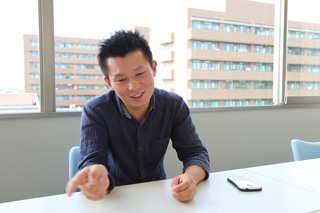 There are also Japanese companies and many Japanese people living there. 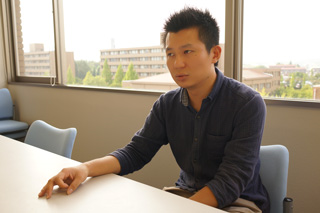 At my university, there are many Japanese teachers. There are also Japanese teachers teaching at Japanese language schools in town. What motivated you to study in Japan? When I was little, I saw a Japanese anime and I was impressed by the beauty of Japanese nature. I felt the difference between China and other countries. At first, my image of foreign countries was limited to America and Europe, but when I became an elementary student I started to watch animated films and I found a unique beauty different to that of the Western countries. I made up my mind: I want to go to this country and see it with my own eyes! That’s why I decided to come to Japan after graduating university. When you really came to Japan, could you find what you saw in the animation films? Yes. Many places showed in the animation films really exist. But for Chinese people it is quite difficult to come to Japan. We need a visa. Nowadays it is easier to get one than before but it is still quite complicated. That’s why I chose to take Japanese language as my major at university. Then I came here in 2008. I see. 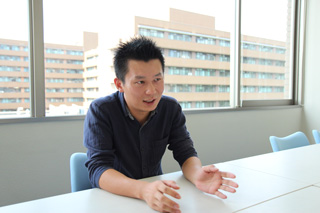 Why did you choose Hiroshima University? I just wanted to go to Japan and so I asked a Japanese teacher at our university for advice. This teacher recommended me to go to Hiroshima, saying that it’s a quiet and nice place. As I prefer quiet places to big towns, Hiroshima University was the right choice for me. It’s the best environment to concentrate on your studies. There is not too much entertainment. That’s good for me, because I came here to study not for fun. 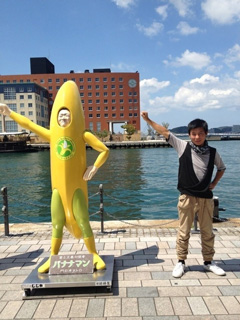 But it doesn’t mean that Higashi-Hiroshima is remote or countryside (laughs). Did you lead a dormitory life after entering university? Yes. But that time we could stay there only for one year. Now, two years are possible. Presently, I live in an apartment in Saijo. At the shopping center nearby. I don’t care. I’m also not fussy about clothes. Plus, I have no money anyway (laughs). Japanese groceries are quite expensive, especially watermelons. Eggs are not, but fruit and vegetables are expensive. Is there anything you are absorbed in? I like traveling. It’s summer now, so I want to go to the sea. The place I want to go most now is Tsunoshima Island in Shimonoseki City. I have been there before. I want to go there again. You can’t go by bus, and even by car, it takes about 4 hours．It’s really difficult to go there. What do you research at university? I’m researching on the training of childcare workers, particularly about kindergarten teachers in China. I study about their mental health or their stress. What kind of stress do kindergarten teachers feel? There are many factors but first among such factors are relationships in the workplace. It’s the same in Japan, isn’t it? Then, it’s the job itself. Caring for children is difficult work. There are so many things one has to consider. For example, you have to protect the children from being injured. Children do and want to do things completely differently than adults, so you have to be very careful when they do things. The problem is not only the child but also his/her parents. Some parents are very demanding. Mostly, Chinese families have only one child and in my case, I’m an only child, too so I think that many such parents fuss over their only child too much. Is it more serious than in Japan? Yes, it is. They want this or that for their extremely precious, beloved child and they become very demanding toward the kindergarten teacher. Then, teachers become stressed. In addition, almost all of the kindergarten teachers are women. They also have to care of their own families. For example, they have to do household chores or cooking. And the pay and working conditions are far from blessed. That’s why the employment turnover rate is very high. I think that it’s the same situation in China and Japan. Stress is one reason for high job separation rate, right? What’s the cure for this stress? There are mainly two ways of stress reduction: One of them is to increase the salaries. The present pay is not enough. An investigation through Yahoo shows that also in Japan low salaries is the number 1 reason for job separation. Also in China, the pay is averagely low. And career progression is limited. Even if a kindergarten teacher becomes a principal, she still can’t earn so much money. Therefore it’s important to improve the working conditions. The second method is to focus on the teacher herself and to increase the response capacity to deal with difficulties. For example to keep up one’s mental stability even when being harshly blamed by parents. If they do that, that would help to improve the situation. In case of no improvement, it will at least be possible to prevent the teacher from getting hurt. For stress reduction, I mainly recommend these two methods. It must be very hard to be a kindergarten teacher. I think it was more easygoing in the past by just letting the children play but intervening only in dangerous situations. Of course, nowadays the work of a kindergarten teacher is not like this at all. It is not enough to supervise children. The teacher also has to make a schedule and to decide the teaching plan. The children still have time to play freely, but everything is planned. For example, when the children come for four hours, they play freely for one hour, then another hour in groups, etc. The teachers have to make a time schedule and manage everything. Do you actually interact with children? Of course, I also talk with children by visiting kindergartens because that is part of my lesson. By observing children, I analyze their behavior. For example, I have to analyze what a child said, did, and what that meant. It’s not just that they said this, or did that, because there’s meaning to everything a child does. As researchers we have to analyze that. When you say kindergarteners, you mean 3, 4 and 5 year olds, don’t you? That's right. But there’s a big difference between five-year-olds and three-year-olds. For example, in the case of three-year-olds, when they enter kindergarten, because they are not too used to that environment, they stay close to the teacher. Moreover, they do not play in groups. When they turn five years old, they play in groups. Also, three year old toddlers are not clear about what their own interests are. Since they don’t know what they want to do, they are likely to follow the instructions and guidance of teachers in many cases. On the other hand, when they become five years old, if they want to play, they go to play on their own initiative. I do not play together with children in practice, and I only need to view how children play and analyze as part of the lesson, but watching them doing so is very interesting. You like children, don’t you? Children are very interesting. They play by self-made or original rules. Only they know them, and adults have to observe very diligently to understand them. Whenever I discover such rules, I feel how great children are! Do you have an idea how to put your research to use? I want to use it to reduce the stress of kindergarten teachers. Then, the quality of childcare would improve. That’s the most important thing. By the way, are there big differences between the life of a student in China and Japan? The biggest difference is that in China all of the students live in dormitories and not only students who come from far away. In Japan it is not like this. The dormitories and the dining rooms are both on-campus. Everybody sleeps, eats and studies on-campus. In almost all of the dormitories one room is used by more than three students. When you have no experience of group living, it is hard to get used to that, but then, you can make a lot of friends. How is life as a student in Japan? It’s a bit different to that in China. As because everybody lives in dormitories in China, the students have lectures together, eat together and often have fun together. 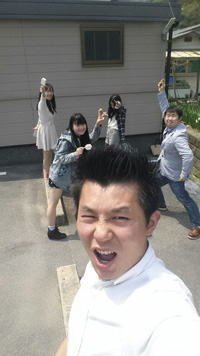 As the students are all friends, bonds between them are deeper than in Japan. 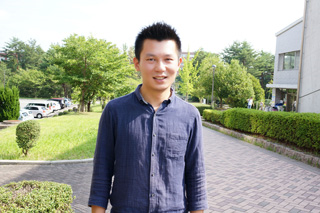 You are the former president of the Association of Chinese Students in Hiroshima University. Why did you take on such an important responsibility? For international students Japan is still a foreign country. I can speak Japanese, but many students at IDEC (Graduate School for International Development and Cooperation) don’t know Japanese, because they can attend lectures in English. But when they can’t speak Japanese, they have many difficulties in daily life. That does not mean that a student can’t do anything by himself. He can also find a room by himself even though he doesn’t speak Japanese. But with some help, he can do even better. If you have heard about the “Seishun 18 Ticket”, you can benefit from it. Otherwise you have to pay the standard charge to ride a train. Further, every year, the Association takes members to see colorful autumn leaves or cherry blossoms. They would need to think about so many things to go there alone. But with a chartered bus, there is nothing to worry about. They just have fun. Anyway, doing something alone may be difficult. We help people making things easier. That’s the purpose of the Association. I wished that all of my Chinese friends could get used to the life in Japan and to contribute to that. That’s why I took on the position of the president. Do you often participate in events on the campus? Yes, every year at the university festival I sell boiled dumplings or sui gyoza with my Chinese friends. Have you never come and eaten it? You must come! It’s very delicious. In Japan, pan-fried dumplings or yaki gyoza are more popular. But in China it is the opposite. Of course, I prefer boiled dumplings! It starts with making the dumpling skin. It’s handmade. Even I can make it. But it’s quite a hard job. And the skin sold at Japanese supermarkets is too thin. It’s made for pan-fried dumplings and you can’t use it for boiled ones. If you boil them, they will get torn very easily. The skin for boiled dumplings with meat inside should be much thicker. Please give me some advice for Japanese students who want to study in China. Studying abroad is a great life experience. You can know other cultures and the life in foreign countries. That’s very meaningful. You can make great personal progress, too. But don’t forget to make preparations before you go. It’s difficult to understand perfectly, but it is necessary to acquire a certain level of language ability in order to understand at least easy things. When you go to China, you will face trouble without knowing the slightest bit of Chinese. The most important thing is to take courage but the second is to be prepared properly. When you go to China, is there anything you shouldn’t forget to take with you? Money! Prices however, are low. When you stay in a dormitory, it just costs you about 20,000 JPY a year. Dormitories also have dining halls in other buildings where you can eat. A meal there costs about 80 JPY. Even the most expensive one is only about 100 JPY. 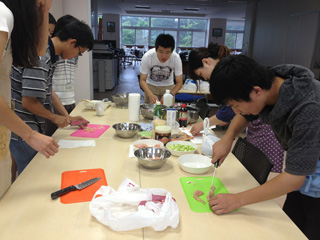 For your information, cooking your own food in Chinese dormitories is impossible because there is no kitchen. That’s why many Chinese university graduates can’t cook at all. When I’m with my family, my mother makes me help her. That’s why I can cook (laughs). That’s quite unusual. Please give some advice to your junior fellows who want to study in Japan. Japan is a very safe country. You don’t need to worry about anything. It’s enough to study just a little bit of Japanese. No problem. That’s all. You mean “just a little bit of Japanese” will do it? Yes, it will because our countries have a common culture of Chinese characters. You don’t need to be able to read Japanese properly, you can understand in a way. 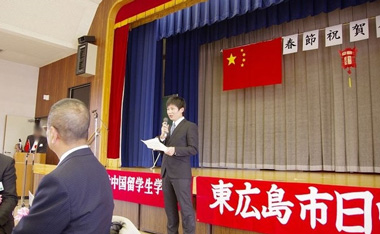 It is difficult for Japanese people to read Chinese, but relatively easy for Chinese people to read Japanese. Japanese is easy to learn for us, although you need to make some effort. That’s my opinion. In conclusion, tell us about your future goal. I want to be a university teacher. It doesn’t matter whether in China or in Japan, but I want to become a teacher at childcare training school in future. My goal in the nearest future is to successfully do my presentation in August on Bali Island in Indonesia. At the moment, I’m earnestly making all necessary arrangements towards that goal. I wish you a lot of success for your near and far future goals. Thank you very much. I’ll do my best!